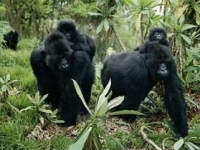 Enjoy one of the greatest wildlife experiences on earth in Rwanda spending time with the gentle giant gorillas as they go about their daily life. You will trek away understanding what kept conservationist Dian Fossey living in the forest for 18 years protecting these wonderful animals. 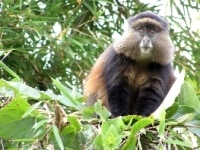 Another tracking highlight is to view the Golden Monkeys also located in Volcanoes National Park. Incredible wildlife and spectacular landscapes await you on your Kenya safari. The Masai Mara, the most popular game reserve, offers fantastic all-year-round game viewing. 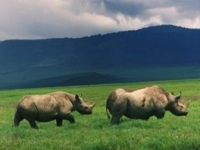 Masai Mara Game Reserve acclaimed as one of the finest safari region in Africa exhibiting the Big 5. 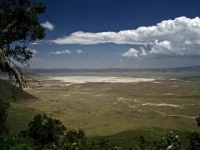 Lake Nakuru for colorful flamingo, bird life and pods of hippos. Nairobi to visit a Giraffe Orphanage. Nairobi to visit Karen Blixen home, author of "Out of Africa", to understand the life of Europeans during the colonial period. Guaranteed window seats in Kenya Safari vehicles with pop-up roof. Superior First Class and Deluxe accommodations. US Citizens require a passport valid for six months beyond travel dates. A Kenya Visa will be required and Yellow Fever Certificate. Board your Ethiopian Airlines brand new Boeing 777 for a non-stop overnight flight to Addis Ababa. Arrive early morning into Addis Ababa, with a convenient connection on Ethiopian Airlines flight to Kigali, Rwanda. After clearing customs, continue this afternoon for a scenic 2-hour drive through rain forests towards Volcanoes National Park to the town of Musanze and check-in to the Gorillas Hotel. This new hotel is centrally located in the town and has 31 comfortable rooms. Early this morning meet with your respective park rangers, who know the various Gorilla families quite well. 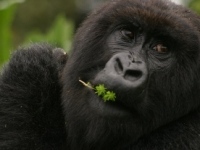 These rangers know where the gorillas were the day before you arrived. It is then a simple matter of going to that spot and picking up their trail. The object is to meet up with the family about mid-morning, a traditional time when they cease feeding and rest for about an hour. 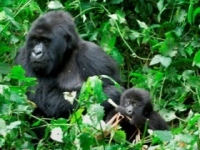 Some Gorilla families are found in one hour but there are known cases where the trek lasted for as long as 8 hours. After returning to the hotel for lunch, enjoy the afternoon of leisure by visiting nearby markets in the town of Musanze. Return to the entrance of the Park early this morning to see the Golden Monkeys. It is now believed the only feasible population of these Golden Monkeys resides only in Volcanoes National Park. They are beautiful and endangered primates which have become quite habituated to humans, making it possible to observe them closely. After lunch at the Lodge, return to the capital city of Kigali for a city tour. You will visit the Kigali Genocide Memorial built in April 2004 on the 10th Anniversary of the Rwandan Genocide. This Centre is built on a place in Kigali where over 250,000 people were buried after the genocide. Check-in at the Golf Hills Residence and enjoy the evening at your leisure. Late this morning board your flight to Nairobi, Kenya. Upon early afternoon arrival, you will be met and transferred to the Nairobi Safari Club Hotel. Enjoy the balance of the afternoon and evening at your leisure. Leaving Nairobi after breakfast, you'll travel towards Kenya's fertile highlands and head down the Rift Escarpment on a road built by Italian prisoners of war during World War II. Look for the charming chapel they built at the foot of the escarpment. You'll pass the impressive Longonot earth satellite station as you head across the Valley to Narok, and then travel across acres of wheat and barley, before you reach your home for two nights at the Mara Sopa Lodge in time for lunch. The accent around the lodge is the wildlife, spacious bedrooms and a large pool with wonderful views. Following lunch, there is an afternoon game drive into one of the most prominent game reserve in Africa. The Masai Mara is one of the largest and most well known wildlife reserves in Africa. It has an abundance of the “Big Five” wildlife., Lion, Leopard, Black Rhino, Elephant and Cape Buffalo. Enjoy an early morning game drive and a late afternoon game drive, the best time for viewing the animals. During your leisure time lunch will be served at the lodge and have an opportunity to relax by the large pool offering wonderful views. Note: Departures in July, August and September will witness the popular Mass Migration. Leave the Masai Mara and travel across the “breadbasket” of Kenya, where acres of wheat and barley litter the landscape as you head north to Narok. From here travel across the vast plains on the floor of the Rift Valley, keeping an eye out for herds of giraffe and gazelle as you head up the Mau Escarpment, before arriving at Lake Nakuru Lodge for lunch. This afternoon's game drive highlights the lake which is often colored with shimmering pink flamingos and thousands of the most beautiful birds lining the shore line. In addition both black and white rhino roam this area including the Rothschild giraffe and a fair share of buffalo, leopard, zebra and lion. Depart this morning and head south to Nairobi to visit a giraffe orphanage. Visit and stay for lunch at the Karen Blixen home a pioneer coffee farmer and acclaimed author, famous for her book “Out of Africa”. The home has been converted into a museum and will provide you an opportunity to step back in time and gain insight into this remarkable woman's life. Proceed to the airport for your late afternoon flight to Addis Ababa and convenient connection for your overnight flight to Washington D.C.
Day 10: ARRIVE WASHINGTON D.C. Arrive early morning into Washington D.C. Dulles Airport. After your Kenya Wildlife Safari fly from Nairobi to Ethiopia. Early evening arrival into Addis Ababa and transfer to the Jupiter International Hotel (Bole). This morning board your flight to Gondar. Gondar was once the old imperial capital founded in the 17th century by Emperor Fasilides who built a palace and seven churches. The subsequent five Emperors built their own respective palaces and Gondar became known as the Camelot of Africa. Visit the royal enclosure containing six castles, a complex network of connecting tunnels and raised walkways. Proceed to the fascinating Debre Birhan Selassie Church with its walls and ceiling decorated with scenes of Biblical lore and medieval history. Check- in to the Hotel Goha, which stands on the crest of a hill with commanding views of the ancient castles and churches of Gondar. This morning a short flight takes you to Lalibela, a destination considered one of the best kept secrets of rock churches, nicknamed the “Petra of Africa”. Ethiopia's Emperor Lalibela, who had visited Jerusalem, attempted to build a New Jerusalem in response to the capture of Jerusalem by Muslims in 1187.Only its relatively remote locations and international obscurity keeps Lalibela from seeing the same levels of visitors to Petra. Visit the twelve majestic rock hewn churches, which are still used as places of worship. Check-in to the Mountain View Hotel. Depart late this morning arriving into the capital city of Addis Ababa. Visit the National Museum, whose most important exhibit is a replica of the skull of Lucy, a woman who had lived in Eastern Ethiopia about 3.5 million years ago. Continue to Mt. Entoto for a breathtaking view of the city and continue to the Merkato Outdoor Market. This evening enjoy a traditional Ethiopian meal, dance performance and coffee ceremony. Transfer to the airport for your overnight flight to Washington D.C. This morning embark on a Mombasa City tour which dates back to the 12th century when spice traders arrive from Arabia. Visit the old quarter, dominated by the medieval Fort Jesus built by the Portuguese in the 16th century. After your visit to the fort view the ancient mosques, the narrow bustling streets, the old dhow harbor and central market. Visit the Akamba wood carvers where you have the opportunity see the carvers at work. This afternoon enjoy the amenities of the resort whether it is snorkeling, glass bottom boat cruise or simply laying by the pools or beach. Enjoy the unspoiled Kenya Coast aboard an Arab Dhow. Cruise turquoise seas to the ecological mangrove islands and a people to people experience with the Shirazi tribe. Cruise to Funzi Island to visit an historic fishing village, which was formerly connected with the slave trade and lies in ruins. From here visit the village school, a private house and the market place. Continue to a unique sandbar, where one can swim or simply wander over the pure white sand in the middle of the sea. Sail to the uninhabited island of Kinazini for a sumptuous sea food lunch. Then board canoes to explore the mangroves of the Ramisi River to view crocodiles and various species of birds. Enjoy a morning of leisure before your early afternoon transfer to the Mombasa Airport. A short flight takes you to Adis Ababa to connect with your flight to Washington D.C. Arrive early this morning into Washington D.C. Dulles airport for a connecting flight to your home city.